The Issue: Does the Constitution protect the decision to end one's own life, at least if one is terminally ill or in great pain? Seven years later the Court faced right to die issues again in two cases involving challenges to laws criminalizing physician-assisted suicide. The lower courts in each case, one involving a Washington state law and another a New York statute, found the laws unconstiutional--at least as applied (the 9th Circuit decision rested on due process right-to-privacy grounds, the 2nd Circuit decision on equal protection grounds.) The Supreme Court reversed in both cases, finding the laws to be constiutional. Although the Court interpreted Cruzan as recognizing a right to refuse medical treatment, the Court found no constitutional basis for a right to assisted suicide. Three justices in concurring opinions (O'Connor, Breyer, Stevens) indicated that they might be willing to uphold "more particularized challenges" to such laws, such as--for example--an as applied challenge to a state's refusal to assist a terminally ill patient in severe pain from ending his or her life. In 2006, in Gonzales v Oregon, the Court decided another right-to-die case, although this one primarily on administrative law grounds, not constitutional grounds. Voting 6 to 3, the Court ruled that Attorney General Ashcroft exceeded his powers under the Controlled Substances Act when he threatened prosecution against Oregon doctors prescribing lethal drugs under that state's Death with Dignity Act. Writing for the majority, Justice Kennedy concluded that regulation of medical practices was primarily a job for the states and that Ashcroft failed to recognize "the background principles of our federal system." 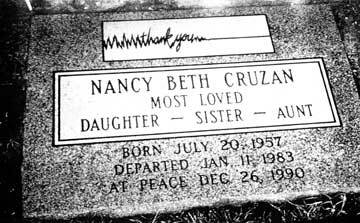 Bill Colby, who represented the Cruzan family in their efforts to discontinue Nancy's feeding, has written an excellent book, Long Goodbye:The Deaths of Nancy Cruzan, about this sad case--and its tragic aftermath. 1. 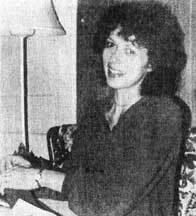 Doctors examining Nancy Cruzan concluded that she was in a persistent vegetative state, had no awareness of her environment, and had no hope of EVER having awareness of her environment. What reason is there to doubt that any person in Nancy's circumstances would want--if they were capable of even wanting--feeding to be continued? Was there any evidence at all suggesting Nancy would want to continue to "live"? 2. In what sense could Nancy Cruzan even be considered a "person"? What are the essential attributes of a person? 3. Since Nancy could feel neither embarrassment or pain, isn't it really only the empathetic interests of the family at stake? 4. 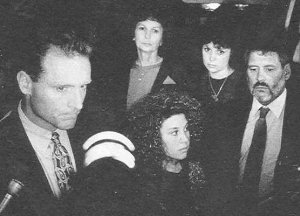 What if Missouri defined Nancy as dead and ordered her feeding discontinued against the wishes of her parents? Would they have any constitutional claim? 5. Was Missouri using Nancy as a symbol? As a symbol for what? 6. Should it matter whther the decision involved was to discontinue feeding rather than extraordinary treament such as a ventilator? 7. Could Missouri have prevented the Cruzans from taking Nancy to another state which would allow their wishes to be carried out? 8. If there was a right to assisted suicide, as the 9th Circuit found, why should the right be limited to terminally ill and competent adults? Why would persons in great pain, or who are severely depressed, also have such a right? 9. Does the distinction between passive euthanasia (withdrawl of feeding tubes, for example) and active euthanasia (administration of lethal drugs, for example) make sense to you? 10. What state interests supporting laws against physician-assisted suicide do you think are the strongest?